Current practices for the management of Barrett’s esophagus (BE) vary across Europe, as several national European guidelines exist. This Position Statement from the European Society of Gastrointestinal Endoscopy (ESGE) is an attempt to homogenize recommendations and, hence, patient management according to the best scientific evidence and other considerations (e.g. health policy). A Working Group developed consensus statements, using the existing national guidelines as a starting point and considering new evidence in the literature. The Position Statement wishes to contribute to a more cost-effective approach to the care of patients with BE by reducing the number of surveillance endoscopies for patients with a low risk of malignant progression and centralizing care in expert centers for those with high progression rates. MS1 The diagnosis of BE is made if the distal esophagus is lined with columnar epithelium with a minimum length of 1cm (tongues or circular) containing specialized intestinal metaplasia at histopathological examination. 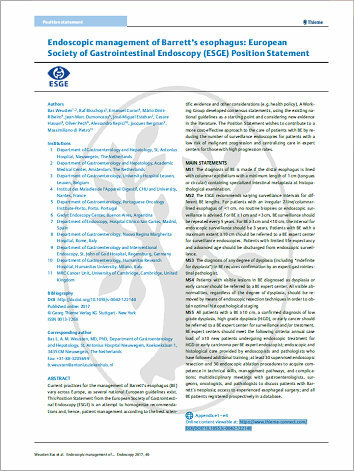 MS2 The ESGE recommends varying surveillance intervals for different BE lengths. For patients with an irregular Z-line/columnarlined esophagus of < 1 cm, no routine biopsies or endoscopic surveillance is advised. For BE ≥ 1 cm and < 3 cm, BE surveillance should be repeated every 5 years. For BE ≥ 3 cm and < 10 cm, the interval for endoscopic surveillance should be 3 years. Patients with BE with a maximum extent ≥ 10cm should be referred to a BE expert center for surveillance endoscopies. Patients with limited life expectancy and advanced age should be discharged from endoscopic surveillance. MS3 The diagnosis of any degree of dysplasia (including “indefinite for dysplasia”) in BE requires confirmation by an expert gastrointestinal pathologist. MS5 All patients with a BE ≥ 10 cm, a confirmed diagnosis of low grade dysplasia, high grade dysplasia (HGD), or early cancer should be referred to a BE expert center for surveillance and/or treatment. BE expert centers should meet the following criteria: annual case load of ≥10 new patients undergoing endoscopic treatment for HGD or early carcinoma per BE expert endoscopist; endoscopic and histological care provided by endoscopists and pathologists who have followed additional training; at least 30 supervised endoscopic resection and 30 endoscopic ablation procedures to acquire competence in technical skills, management pathways, and complications; multidisciplinary meetings with gastroenterologists, surgeons, oncologists, and pathologists to discuss patients with Barrett’s neoplasia; access to experienced esophageal surgery; and all BE patients registered prospectively in a database.